Guess what $2,500 will get you? Bail in Albuquerque, if you’re UFC light heavyweight champion Jon Jones. The 27-year-old Jones (21-1) was allegedly involved in a hit-and-run accident over the weekend that broke a pregnant woman’s arm. Jones finally turned himself in after fleeing the scene on foot and everybody from TMZ to the Washington Times reporting he was a wanted man. 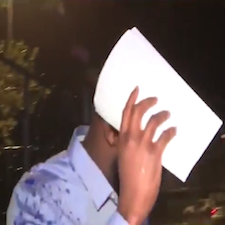 Now reporters have captured Jones on video leaving jail after posting bail. The champ covered his face and ran from the cameras. Jones is set to defend his title on May 23 against Anthony “Rumble” Johnson and so far as we know that bout is still set to happen as of now. Jones appeared in court on Tuesday for a felony first appearance and is currently out on bond.